On newsstands now. Check it! This issue also contains great photography from my friends Arian Stevens, Amber Toner, and Adrienne Comeau, among others. 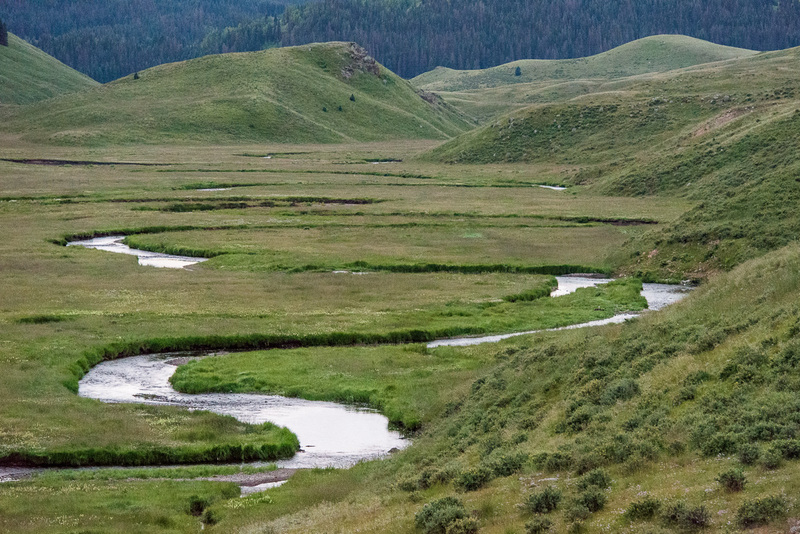 Help Western Rivers Conservancy SAVE BLUE CREEK! Help Western Rivers Conservancy purchase the final 10,000 acres of land to save Blue Creek, a coldwater lifeline for some of the greatest salmon and steelhead runs on the West Coast. By contributing, you’re helping create a sanctuary in the heart of the California redwoods for these magnificent fish and the region’s increasingly imperiled wildlife. One by one we can Save Blue Creek. Forever. In 2008, WRC began an effort to create a sanctuary at Blue Creek. We’ve raised funds to do this through individual donations, private grants, public funding and elsewhere, and we’ve already purchased over 37,000 acres. To finish off the 47,000-acre project, WRC needs your help to buy the remaining 10,000 acres. Our overall goal for this is $12.8 million, and we’re asking individual donors on Indiegogo for $5M of that. We’ll make announcements throughout the campaign to keep you informed on how close we are getting to our goal. Individual donations are important because each goes to saving a place that is valuable not just to the Klamath River, but to the world around it. The Klamath-Siskiyou ecoregion is one of the most biologically diverse regions on the entire planet, and Blue Creek is a vital part of it. You’ll help save fish, wildlife, redwoods and a river that matters to this rare and wild place. Each square foot saved counts. I was recently notified that my 2015 film, Wild Fish Works: Oregon Coast, will be included in the 2016 Wild & Scenic Film Festival in Grass Valley, California. I’m thrilled to be able to join friends and fellow filmmakers at this event January 14-18, and share the message in support of collaborative wild fish conservation in the Pacific Northwest. Please let me know if you’re planning to be there! One lane on the Salmon Superhwy: Trask River, a tributary to Tillamook Bay, Oregon Coast. Shot with Hasselblad 503CW, 50mm CFi and Fuji Velvia 120 film, ISO50. The Salmon Superhwy Initiative is one of the most impactful, inspiring projects on which I’ve worked. Beginning back in late 2013, I was asked by longtime friend and Trout Unlimited staff Alan Moore to consider an ambitious documentary that would serve as the creative platform for a nascent conservation initiative. Alan and I had brainstormed a lot of ideas while fishing together over the years, but this one really hit home for me. I did not hesitate to go all-in, committing to photographs and a short video to help launch the campaign. I had no idea that I would still today be working in support of this important effort, but I am grateful to be doing so. The campaign’s still photography work has been wide-ranging, from portraits to scenics to true documentary-style photojournalism. A selection from the most recent shoot can be seen HERE in the “New Work” section of the website; some additional content is located HERE in the “Conservation” section. To learn more, please spend some time on the Salmon Superhwy website, follow along on Facebook and Instagram, and share with those who might also be interested. Thanks! 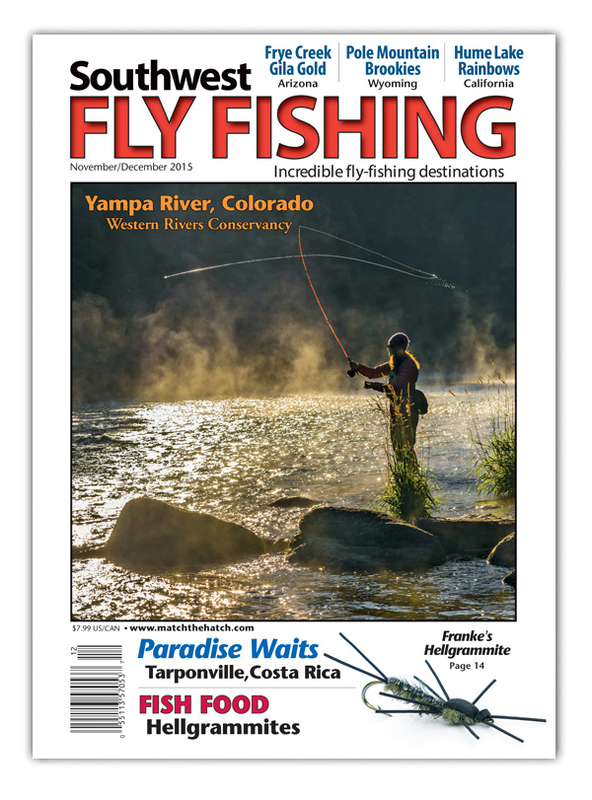 Since the new issue of Southwest Fly Fishing magazine is now dropping, I am happy to see one of my photos (with my wife as the angling model) on the cover. There are additional photos inside included in the “Exposure” section, supporting the good work of my friends at Western Rivers Conservancy. Check it out! 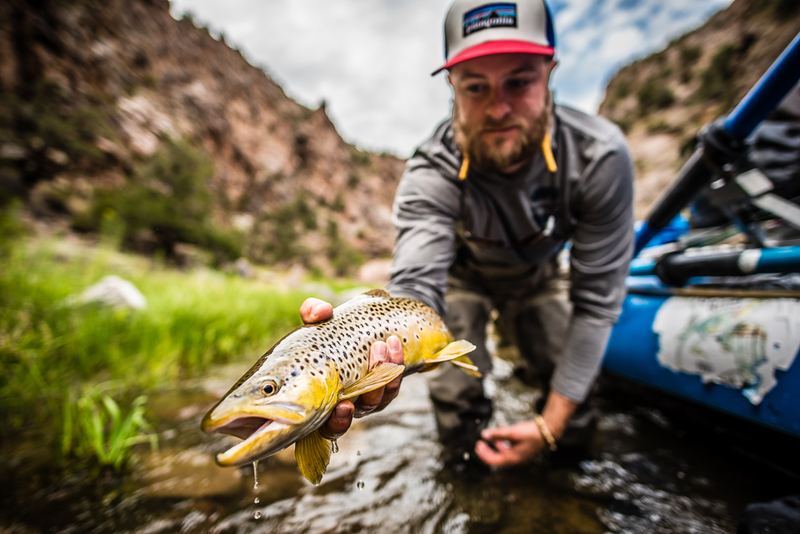 Three disparate Colorado locations, five days of shooting, not a lot of sleep, and plenty of quality truck time. At least it occurred at summer’s peak. Here’s a look back at one of my favorite shoots from this past summer, along with a brief recount of the work – highlights, lessons-learned, and what helped make the shots happen. 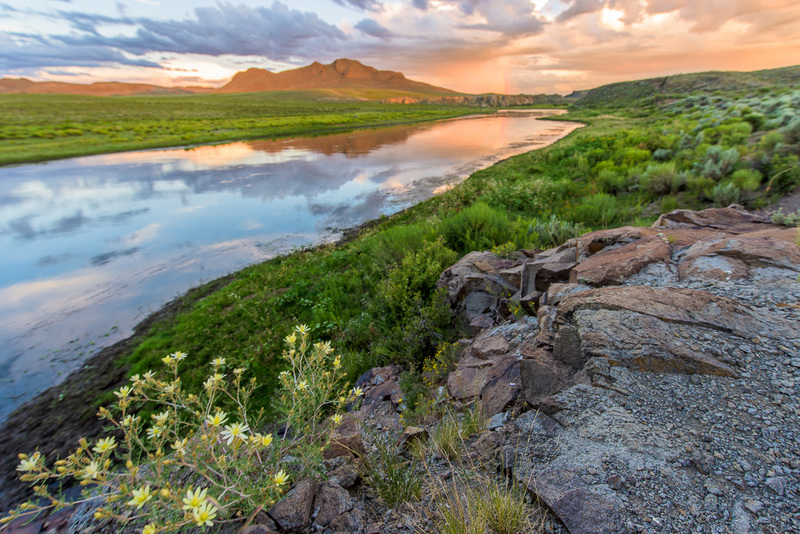 Brownie Hills and the Rio Grande, July 2015. I’ve worked with Western Rivers Conservancy since 2006. During that time, I’ve had a number of opportunities to not only photograph beautiful places, but be inspired and energized time and time again. During recent years, the organization has become much more active in the Rocky Mountain west, including here in Colorado. When they asked me to shoot three different locations for potential future conservation projects, I jumped at the chance. Schedules, particularly during mid-summer, are tough to manage. I was jam-packed with bookings, but was able to block out three days to try and squeeze the most out of every dawn and dusk. It was like the “good old days,” driving late into the night on twisting mountain roads, sleeping in the back of the truck beside my Pelican cases, living off convenience store coffee and snacks. The only thing I regret is not having more time to spend in some locations. But, that is almost always the case. Preparation is a challenge when you’ve never been to a location, and gauging the spatial context is tough when all you have are maps and Google Earth. But, perseverance and stubbornness helped make the job happen. I’m now excited to see what comes of these precious pockets of Colorado beauty. A creek that shall go unnamed. July 2015. To learn more about Western Rivers Conservancy and their outstanding work throughout the western US, please visit their website. I urge you to consider supporting their mission, which has resulted in a tremendous amount of public access to recreational users. Devin Visciano with some Gunnison gold. September, 2015. The Gunnison River is one of Colorado’s marquee river destinations, and the Gunnison Gorge is considered to be one of the top multi-day whitewater trips in the lower 48. I had the opportunity to tag along with some new friends on a trip in early September led by Chris Mortimer of Gunnison River Pro. From beginning to end, the experience was incredible. An amazing river. Beautiful fish. Jaw-dropping landscape. I’m already looking forward to returning. To view a selection of photos from this shoot, check out the “New Work” section of my website, or just click HERE.